The fate of the Red Skull decided. The birth of KLUH, the strongest one there is. The X-Men join their greatest foe. 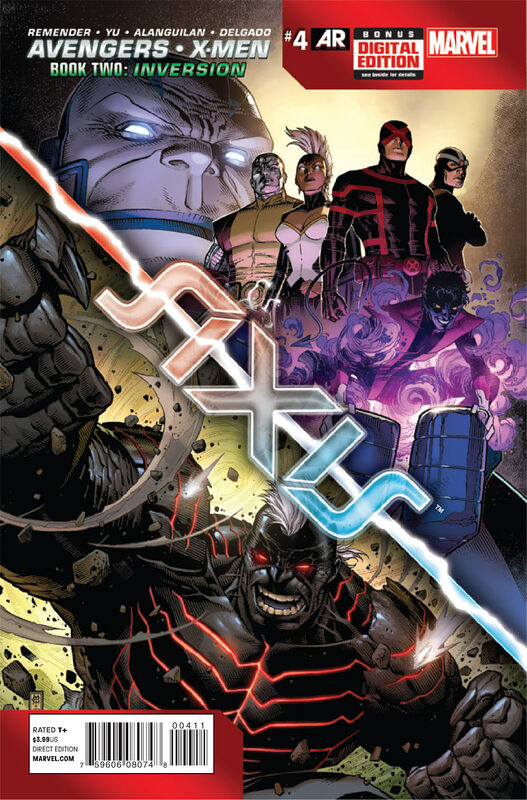 Cover- This one has Kluh on one side and the inverted X-men. It looks great! Story– New Captain America confronts Nick Fury Jr. on the S.H.I.E.L.D Helicarrier Iliad about the Avengers taking the Red Skull into custody. Cap actually physically assaults Nick Fury Jr. before dramatically walking out. Elsewhere Carnage saves some folks by taking out the squid. In another location Tony Stark starts drinking once more. At the Jean Grey school Storm spouts anti-human diatribe before Apocalypse joins her on stage. Magneto walks off upon seeing this and Falcon informs the Avengers that the X-men now backed by Apocalypse will soon go to war with them. Captain America suggests they kill Red Skull before he can be liberated. Hulk opposes them and due to inversion gets sadder and turns into Kluh. After Kluh makes his way into the city the Avengers discover that Red Skull has disappeared from his cell. Art- It looks great from start to finish! Black Heroes– Captain America gets the lion’s share of the spotlight and to great effect. Inverted Falcon/Captain America is a commanding jerk who manages to have nearly the same presence as Steve Rogers/Captain America despite barley even being in costume for two months. There was also a moment where Falcon eavesdrops on the X-men by using his telepathic link with birds that would have been lost on the casual reader. Storm is the other noteworthy black hero that shows up. Her anti-human speech really sold the reality of the inversion process as she has always been more the voice of reason than any other X-man especially in recent years when teamed with Emma Frost, Cyclops, Magneto and Namor on the Extinction team. Storm also looked beautiful and commanding to boot. Inversion- So it’s the second act of the Axis storyline and this is what it’s all about heroes becoming villains and vice versa. Seeing Storm as a human hater and Falcon as bloodthirsty really did give me some kicks though. Mystery– Is the threat as a result of Dr. Doom deliberately screwing up the spell? Or did Red Onslaught plant the seeds of the spell in our heroes minds from the very beginning? Did Jarvis free the Red Skull or did he escape on his own? Or was he ever really in the cell at all? Where is Dr. Doom in all of this? No time to get into it now. Steve Rogers enlists Spider-Man and Nova for an impossible fight. The new Sorceress Supreme comes for revenge on Doom. Iron Man vs Daredevil for the fate of an infected San Francisco. The X-Men claim a new home. The Axis of Evil strikes down the heroes of the Marvel Universe! 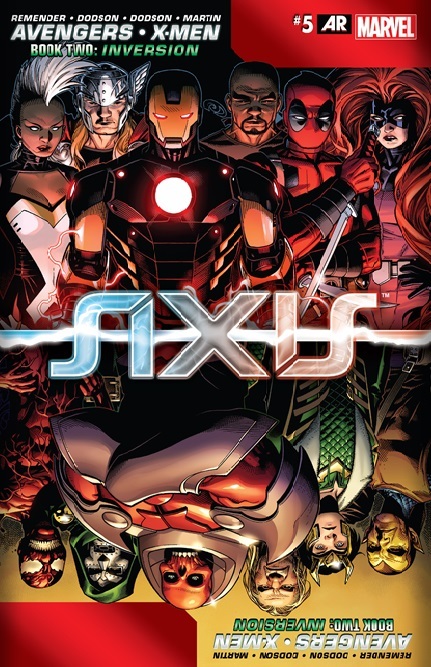 Threat– Apocalypse is on the loose, the top Avengers corrupted, most of the other Avengers captured, The X-men corrupted and Red Skull on the loose with Onslaught’s power. That is one f*** load of a threat smeared all over the walls and ceilings of this room! Black Heroes– All new Captain America has been inverted and has an all new attitude to match. I must confess that I find this version pretty awesome with his no holes bared approach to the task at hand. It’s delicious! Cage seems different but not noticeably so. Black Panther also has a cameo. Action-Watching all New Captain America take on the Inverted X-men gave me a wicked kick considering the last time he tussled with them he was outmatched (See AVX X-men Legacy for those details). He does not fare much better here but did we truly expect him to? Watching Apocalypse pimp slap the current leader of the avengers also gave me a chuckle. Inverted Hulk’s rampage was rather text book but hey, some like it. Summary– All New Captain America has called an emergency meeting with all Avengers and reserve members. Spider-man and Kid Nova bond and are the last to arrive. Samuel quickly takes the gathered heroes down but Spider-man and Kid Nova escape. Medusa, Wanda and Captain America trail but they are rescued by Magneto. The inverted Avengers then split. At Steve Rogers’s base he explains what has taken place on Genosha with the spell that has gone awry. Kid Nova attacks the inverted hulk while the inverted X-men lead by Apocalypse beat up Captain America and declare war on the Avengers. Old Trope– During dark reign did marvel not already have heroes branded criminals and villains branded. How many times have Scarlet Witch, Cyclops, Magneto etc been on both sides of the hero/villain fence? This is getting pretty old people. Heroes’ vs. heroes is also getting old. Art– Terry Dodson’s art is so different from Kubert’s and that shift is jarring.